It has its own well established rigid gas permeable manufacturing lab since 1979 under National Society for the Prevention of Blindness-India. Contact lenses are medical devices placed on the eyes, they require expert fitting and careful instruction, as well as care and compliance with recommended follow-up examinations to maintain the healthy functioning of your eyes. Spherical and toric soft contact lenses for myopia and hypermetropia. Multifocal soft contact lenses for distance ,intermediate and near. Daily wear and monthly disposables contact lenses. Prosthetic contact lenses for opacity. Bandage contact lenses for therapeutic uses. Colour contact lenses in daily and monthly wear. Custom made soft contact lenses for mixed astigmatism ,aphakias and very high myopia hypermetropias and high astigmatism /cylindrical . Keratoconus is a thinning disorder of the cornea that causes distortion and reduced vision. A condition whereby the lower cornea becomes thinner and the optic surface of the cornea becomes irregular and the vision becomes blurry. Laser and Lasik refractive surgery (post lasik ectasia/regression) may result in residual refractive error. In the event that they can not be corrected with further procedures, fitting with specialised contact lenses may be required. Lab is fully equipped with contact lens stocks, trials lenses of all types and inventory with self manufacturing rigid gas permeable lenses and contact lens care solutions. All the trial lenses are maintained in good standards by regular disinfection procedures and replacement procedures. 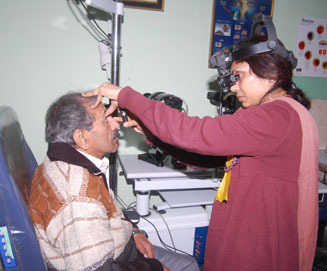 The clinic has well designed hand wash and lens care regimen teaching facilities. Most of the trial lenses when ever applicable are disposable lenses and are disposed after single use in patient. A consistent record of good clinical practice is maintained which includes approvals by an ethics committee, informed patient consent and systematic documentation. After care and regular follow up with proper documentation is maintained.